And do you know how difficult it is to find a "Thank You" photo that's manly? More sightings! Big thanks to SF Site, The Roads of Autumn Dusk, Booktionary, Coffee Rings Everywhere, and Only The Best SciFi for posting my book trailer! I can’t believe how many people have posted the video – wow! 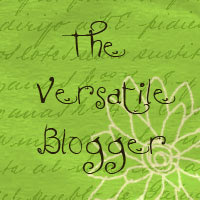 I received The Versatile Blogger Award from Geof at Enter the Man-Cave Thanks Dude! I received a variation of this one previously, but I’ll still hang this one on my wall with pride. And Geof just hit 300 followers! Go tell him congratulations - that is really awesome! I just realized I’ll hit 200 followers soon. Damn, I’ll need to celebrate when that happens. (Hope I notice when it occurs!) Any suggestions? And while Dezz at HOLLYWOOD SPY says he’s decided not to work with kids, he still likes elephants, so keep ‘em coming! Hey Alex, congrats on your almost 200. You can check out my blog to see what I did for my 100 (thanks for noticing it)...though it's probably not practical for your numbers. Best Wishes! Alex, I just watched the book trailer for CassaStar. WOW!! It is SO well done, hooked my attention and drew me right in, and now I'm more excited than ever to read the book. Stellar job! Who produced it? Congrats on the award and all the followers!! Hitting 200 followers soon? Wow...that would be an achievement! Suggestions? Have few closest blog pals do a guest post in celebration of the achievement! Have a nice day Alex! Haha! Great news. Thanks for filling us in Alex. Congratulations on your award and on hitting the 200 followers mark (I'm sure that will happen today). Keep up the great work. Congrats on your near 200 followers also a well deserved award, You have worked hard on your forthcoming book and trailer, I'm sure you'll be a great success. you're only one follower away. I'm sure you'll notice. Congratulations on both the award and your growing number of fans. :) You work hard to keep your followers entertained and informed. And you do a great job. Thanks, Nicole! My publisher created it. Will, I like that idea!! Good stuff, Falen! I'll have to see if I can do a giveaway. Considering my favourite Sci. Fic author was the first to start composing on a typewriter, that is perfect. Congrats! on your trailer, award and many followers. I know this is just the beginning of things to come. Congratulations on your award. I'll be watching to see what you do for 200 followers. I'm inching toward 100. Good job finding a manly thank you note-- that one did quite well, bringing to mind Ernest Hemingway, John Steinbeck and other manly writers back when men ruled the literary landscape. Yay for 200! You deserve it, and I appreciate your support of all of us. I don't know how many followers I've gotten from people saying "I followed your link from Alex's blog." I hope you're planning to send me some elephant food as well with all this elephants from this outbreak of elephantmania around Blogger :)) I see them everywhere, although I swear I never drunk alcohol in my life. Congrats on the award and on the 199 followers (while I'm writing this comment you need just one more follower to hit 200). You will also hit 15,000 visitors to your site soon, which is a much more important number because it shows true love :)))! Maybe you are drunk, Dezz. And I will take all the love I can get. That's cool about all the exposure. I'm glad to hear it. One away, Alex! I'm doing a contest at the moment actually (she says, self-consciously) to celebrate passing the 200 mark (and for sending off my query - woohoo!) Oh, and for my 3 year in blog-land anniversary. Everything at once! Wow! You are almost to 200! Congratulations ahead of time. You've been doing so much celebrating of late that doing something for the 200 milestone is almost anticlimatic. Your book is the really big deal to celebrate. How awesome that your trailer is spreading! Congrats on the award and the followers. You deserve it! Congrats Alex on your followers, your award, and your trailer. You are flying high these days! Grats on the award Alex! You truly deserve it. I'll keep my ears open for suggestions about 200 followers, got nothing at the moment. Maybe a quick interview with yourself about how you got here, how long you've been doing it for, etc. Thanks, Lee. You're right, my book is the bigger deal. Interview myself? That could be funny! Congratulations on the award, and the followers. Wishing you the best. Kudos. you deserve the versatile award. A great word to describe you. One big, all-inclusive congratulations from me too - for the success of the book trailer, for the NOW 200 FOLLOWERS, for the award and for finding a manly "thank you" picture (that one made me giggle)! And glad I gave you a chuckle, Cruella. Who doesn't like elephants? @JeremyCShipp just asked on Twitter what animal people would like as pets, if any animal could be miniaturized to pet size, and my wish was for a miniature elephant. They're awesome critters, and they'd still be awsome if they were the size of chihuahuas. *snort* Concerned about that manly thing, are you? Had never crossed my mind that the thank you pics might all be glittery or flowery, but I suppose that's true. I'm thinking you give each of your followers $10.00. Begin in alphabetical order but skip the A's (they are ALWAYS first!). Go directly to the B's. Betty, I will keep that in mind. Hart, almost every thank you is flowery! Wow! Congrats on the almost-200 mark! And congrats on the award. I like your "Thank you" pict. Very manly and writely, to boot. You've done it! 201 followers! Break out the champagne ladies and gents! Congrats Alex! I think you've just hit 202 followers as I've just clicked the button to follow you! Thanks for the visit to one of my blogs! Would like to know when Cassa Star is out! Congrats on the award and for hitting 200 followers!! Where's the party at? I'll invite the strippers...err mean order the cake. You deserved the award Alex. Congrats on making it to 200 followers. That's great! Lydia, I searched a long time for that award. Thanks, Len! There's page at the top of my blog with the synopsis and trailer for CassaStar. Powdered, I have something big in mind! You're right about the Thank You photos AND cards that are downright feminine. Maybe you can launch your own designs? !